Buying a new or used vehicle in Missouri? The time you are likely to spend at a dealership if you are purchasing a car can take up to half a day or more depending on where you are making the purchase and how ready you are to buy. At some dealerships, the paperwork process is cumbersome and painfully slow because of all the boring steps required for registration, financing and signing the final sales contract. At Bryant Motors, we know you just want to drive away with your new car as soon as possible, which is why our car financing specialists try to make the process as speedy and painless as possible. However, we need your help, too. Continue reading to learn about the documents you will need to purchase a car from us (and most car dealerships) or trade-in your vehicle. With a little preparation, we can get you behind the wheel and out on the highway in no time! Valid driver’s license. Your driver’s license serves two purposes: 1) proof that you are who you say you are when applying payments or signing on the dotted line, and 2) confirmation to the dealer that you are registered by the state to drive the car off the lot. The dealership may need to make a copy of your license for their records, so be sure to bring it. Proof of insurance. We will also need to see proof of insurance before you can drive your new car off the lot. Missouri law states that one cannot legally drive a car if it isn’t insured. For starters, bring in your current auto insurance card. If you already know what car you are buying, you can call your insurance company and set up a policy ahead of time. Just call the dealership to get the vehicle identification number (VIN). Payment. You’d be surprised how many people accidentally leave their checkbooks at home. Whether you are buying a car in cash or planning to finance the entire vehicle, you will likely need a personal check or credit card to pay the down payment. We recommend calling the finance department of the dealership ahead of time to find out what forms of payment they accept. 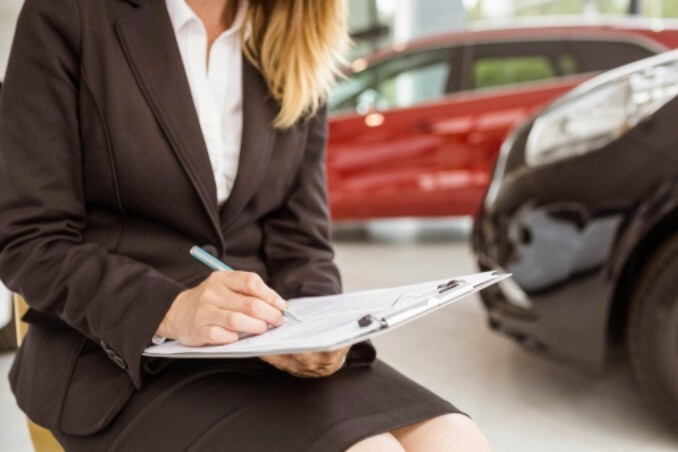 If you plan on securing financing at the dealership, bringing along proof of income and employment (pay stubs) can be a helpful negotiating tool. Title for your trade-in vehicle. If you are trading your current car in for a newer model, you will need to bring the title (also called the “pink slip”) into the dealership. This proves to us that you are indeed the owner. Registration for your trade-in vehicle. We will also need to see a copy of your trade-in vehicle’s current registration if you plan to leave your car at our dealership. The registration and the sticker on the license plate must be active and not expired. Account number for trade-in vehicle loan. If your current vehicle still has an unpaid loan and you wish to trade it in, you will need to bring the loan’s account number. This number can typically be found on one of your payment stubs. You can also contact the lender yourself and ask how the transaction process works. With these documents in hand, you should be prepared to drive away in your dream car! It’s worth mentioning that after you have purchased the vehicle, there are a few other things you have to do in order make your new car legal to drive in the state of Missouri. One cannot legally drive a car in Missouri if it is not titled, registered and if the sales tax is not paid within 30 days of the purchase. While the titling is taken care of at the dealership, registering your new car at the DMV and paying the sales tax is up to you. For cars bought out of state, the new owner must also have the odometer and VIN inspected. Visit the Missouri DOR website for more information on how to register a car in Missouri. At Bryant Motors, our goal is to make the car buying process as simple and straightforward as possible. Stop by our Sedalia car dealership or contact us to speak with a financing expert who can walk you through the process. We look forward to serving you!